Fluorescent lights are commonly used for overhead lighting to view prints and for light table illumination to view transparencies. Incandescent lights are too yellow and too hot. But not just any fluorescent bulb will do -- most fluorescents have a sickly green cast to them, and can cause other ills in attempting to judge the color balance of an image. This Photo Tip will explain how to intelligently select a good fluorescent bulb. 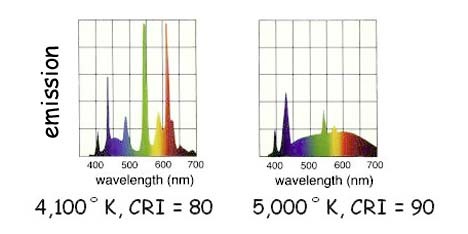 There are two main attributes that define the value of a fluorescent bulb for photographic use: color temperature and color rendering index (CRI). Both are vital. I'll explain each in turn. Every object in the universe of a well-defined temperature is emitting electromagnetic radiation. Electromagnetic waves can occur with any wavelength at all, and the wavelengths emitted by an object are determined entirely by its temperature. Objects at room temperature, for example, emit most copiously at a wavelength of 10,000 nm (nanometers, one billionth of a meter). Since our eyes are only sensitive to electromagnetic waves with wavelengths from about 400 nm to 700 nm (we call these particular electromagnetic waves "visible light"), we do not see these room temperature objects as giving off emissions, even though they are. We only see these objects by the light they reflect. An object heated to 3,200 K -- oh, say the tungsten filament of a photoflood bulb -- has even more of its emission within the visible range. Its peak emission is still just beyond the red end of our visible spectrum, but there is still a lot of red light emitted, somewhat less yellow, and even a little green and blue. We perceive this combination of colors as yellow. Hence, the yellow color recorded on film from photoflood illumination. An object at 5,000 K has emission peaked right smack in the middle of the visible spectrum. Since it emits all colors in (roughly) equal proportions, it glows white hot. If you like graphs, here is one that shows the electromagnetic emission of objects at the various temperatures I've mentioned. You can see that an object's emission is spread out over a wide range of wavelengths. The color we perceive is determined (speaking loosely) by the weighted average of wavelengths within our visible spectrum. Since every temperature gives rise to a unique color perception, these colors can equally well be identified by the temperature that produced them. This is how colors can be labeled by a temperature, the "color temperature" for that color. A dull red might have a color temperature of 2,000 K, a yellow might be around 3,200 K, white is in the vicinity of 5,000 K, and blue can be up around 12,000 K.
Okay, Tim, very nice, you've given me a tour through the concept of color temperature. But so what? The point is that you want to view prints and transparencies with a white light. If you view them with a red, yellow, or blue light you won't be seeing the proper colors in the photograph. Imagine illuminating a print with a red light, for example. Since this light has little emission at the blue end of the spectrum, anything blue in the print won't have much blue light to reflect, and will appear virtually black. Hardly a fair representation of the image! You'd like to view prints and transparencies with a white light, something in the range of 5,000 K to 5,500 K. Such light is also called "daylight balanced" because this is the color temperature observed outdoors at midday in bright sun. Viewing prints under a bulb of 5,000 K to 5,500 K pretty much forces one to use fluorescent bulbs, which don't get very warm, to simulate the light of a very hot object. After all, 3,200 K photofloods are hot enough -- would you really want to work around a bulb burning at 5,000 degrees? Bottom line: you want a daylight balanced bulb of 5,000 K to 5,500 K color temperature. Many people have heard of color temperature and know enough to go after photo illumination that is daylight balanced. What fewer people know is that CRI is another attribute of the light that a fluorescent bulb emits and it is as important as the color temperature in determining the quality of the light. Before I jump into CRI, let me give an example. Hypothetically one could create illumination that was daylight balanced out of very pure blue, very pure green, and very pure red lights. This light would make white and neutral gray objects appear quite properly white and neutral gray -- a perfectly legitimate daylight balanced light. But now imagine shining this "white" light on a lemon, which appears yellow because it reflects mostly yellow light. Our "white" light doesn't have any yellow in it, only red, green, and blue. There is no yellow light in the mix for the lemon to reflect. The lemon, reflecting no light, will appear black. This hypothetical white light is honestly, truly, white -- yet it's a catastrophe as an illumination for a lemon, or a photo of a lemon, or a photo containing any colors at all other than those that perfectly match the component wavelengths of the light source. There seems to be more to the story of illumination than just color temperature! The lemon in this example had its problems because there were no wavelengths in the illumination matching what it can reflect. To be rendered properly, the lemon needs some wavelengths of light in the illuminating lamp that fill in the spectrum between pure red and pure green. Any other color in the scene or photograph to be illuminated has the same problem -- it needs its own color present in the illumination so it can reflect it and look like its supposed to look. The more different wavelengths -- colors -- present in the emission from the bulb, the more accurate the color rendition will be. This is where CRI comes in. 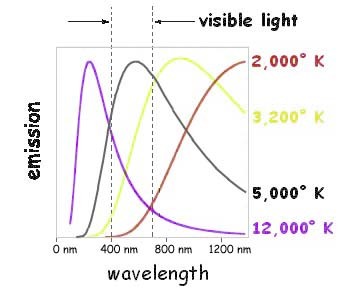 It is a measure of how "filled-out" the bulb spectrum is with all colors present. CRI falls on a scale from 0 to 100, with 100 being a perfectly full-spectrum bulb. Anything above about 90 on the CRI scale is pretty good for rendering colors accurately. Fluorescent bulbs are tricky things, and some can have emission at only a few select wavelengths, almost as bad as the pure red, green, blue light imagined above. It takes work to smooth out the spectrum into a smooth distribution of all colors, so you'll pay more for a high CRI bulb. But for photography applications, it is clearly worth it. The plots below show the emission spectra of two real-life commercially available bulbs, one with a low CRI and the other with a high CRI. You can see the dramatic difference between the two fluorescents, a difference you might not know about if you didn't look into the CRI before making a purchase. To get proper color rendition of your slides or prints you should have illumination that is both daylight balanced and high CRI. This lighting will of necessity be fluorescent.